A simple, tiny and lowest resource taking peer to peer file transfer or file sharing software called uTorrent. It allows sharing files without having server hosting, control seeders and leechers. The light and powerful engine makes it perfect application for exchanging peer to peer connections. Bittorrent is an alternative of uTorrent which can also did similar things. UPnP and IPv6 support has been added for advance secure connections. The free version of µTorrent displays various types of ads which surely puts some load on network. The Pro version is not free but it doesn’t show ads and the other feature is antivirus scanning after completion. Millions of users are using p2p connections for downloading multimedia content (movies and music collection). 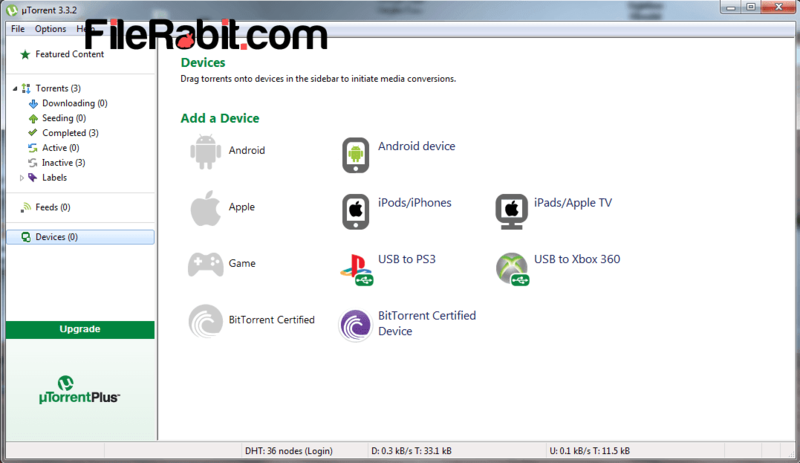 The resuming capability is excellent advantage of µTorrent while grabbing any file from another user computer. The number of seeders shall increase the downloading speed on the other side. However, No. of seeders is an important factor for fast connection between 2 or more computers. The bandwidth limit is an advance thing which will ad custom downloading and uploading speed to torrent files. The max limit for uploading and downloading of torrents are 5 but the user can customize it with changing values. After finishing installation, all .torrent file extensions automatically associate with µTorrent. The directories can be customized in case of local hard drive shows red bar. The app will keeps running in background even after closed to system tray. Bittorrent engine keeps it running in system background but using light resources of CPU and RAM. So it should increase battery life of your laptop with accessing 6 MB of memory.